The eHealth Roadshow will be a private session in which a maximum of 12 innovative companies will present their digital health solutions in a dynamic format: just 5 minutes per company. After the presentations, there will be some Q&A time, followed by an open discussion with the presenters and the members of the committee -CIOs and relevant stakeholders from around the globe that will give you feedback about your solution-. This session is organised as part of the eHealth HUB project, funded by the European Commission, that aims to support commercialization within the eHealth sector among other services. All the companies interested need to apply online. Each application will be reviewed and a maximum of 14 companies will be selected and invited to pitch at the eHealth Showcase. The selection criteria will be based on the maturity of the project, the revenues and the internationalization readiness. 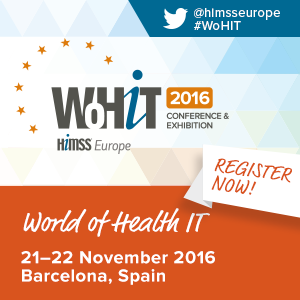 The eHealth Roadshow will take place in Barcelona during HIMSS WoHIT. The admission to the eHealth Roadshow is free but only gives you access to this session: You won’t have access to the rest of the World of Health IT congress, unless you purchase a ticket. Discounts to WoHIT are available for eHealth participants.